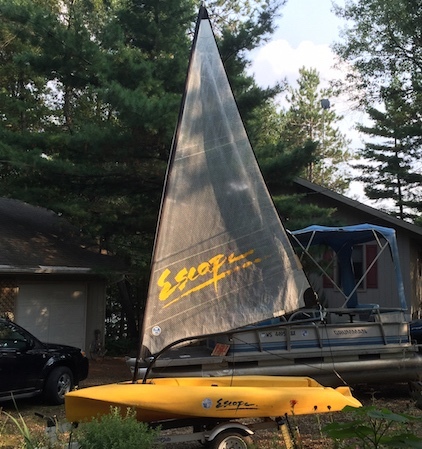 Lightly used CAPTIVA ESCAPE SAILBOAT in great condition for sale @ $1150. Includes rudder, centerboard, and sail. Innovation Award for design. The retail price for this sailboat is $2699.00 plus tax. We are selling ours for $1150. provides high visibility for oncoming traffic to spot. Rigging is easy, with only two lines. A spring-loaded kick-up rudder and a retractable daggerboard get you in and out of shallow water. reduce its power. Kids quickly become confident in this boat and adults love to sail it as well. The Escape is virtually maintenance free. Location: Cecil, WI but, with a sale, could also be delivered to Appleton, Neenah, or Menasha.